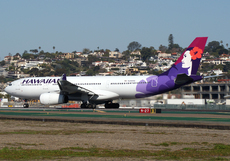 Hawaiian Airlines' flight HAL/HA822 took off from Tokyo/Narita, Japan at ca. 21:00 LT for Honolulu, HI, USA. The A330-200 suffered a hydraulic problem at ca. 21:40 Japan Standard Time while flying far east of Japan over the Pacific ocean, at FL390. The airplane turn back to Japan, and diverted to Tokyo International Airport/Haneda (HND/RJTT) where an emergency landing was carried out at 22:38 LT. No personal injuries were reported.